Check around your windows and doors. Do you notice a cold draft coming in? Check to see if the weatherstripping or caulking might need a touch-up. If this is the problem, kindly ask your property owner to see if they can make the repair. If they won't, you can get press-in-place rope caulk for about $5 per window. It's mess-free and easy to use, and removing it is easy. Is your place, for lack of a better word, a bit rustic? Does it have any large cracks or holes in the walls or near pipes? Try using some expandable foam to fill in the gaps. Trapped air works well as an insulator and you can create it by installing clear plastic film across the inside of your windows. You can buy kits of various types that usually involve the included double-sided tape and the use of a hair-dryer. Be sure to measure your windows first before heading to a hardware store or Wal-Mart as the kits also vary by size. Be careful to apply the tape where it won't damage paint when you'remove it. Expect to pay $2-6 per window. If you have a ceiling fan it likely has a reverse switch. Switch it so the air blows down. This will keep the hot air that rises to the ceiling circulating back down to the floor. 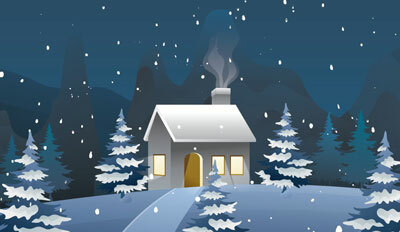 Make sure your heating units and vents aren't blocked. A stack of papers covering a heating unit can prevent your place from warming up, unless of course it causes a fire, which is just one more reason to avoid blocking your heating units. Consider getting a humidifier. Adding moisture to the air can make things feel warmer.